Partly cloudy this morning, then becoming cloudy during the afternoon. High near 65F. Winds NW at 10 to 15 mph.. When Lewis and Clark reached the Pacific Ocean more than two centuries ago, they found Tillamook Indians at the site of present-day Cannon Beach. Despite a language barrier, the explorers and the Native Americans (called Killamucks by Lewis and Clark) were able to converse about the basics of life. "The ... Killamucks are very loquacious and inquisitive; they possess good memories and have repeated to us the names capasities of the vessels and of many traders and others who have visited. ..."
At that time, Lewis and Clark estimated the Tillamook Indians to number 2,200. U.S. tribal records indicate that by 1845, the population had dwindled to 400 - then, to only half that number four years later. Now, 160 years later, the language of these Native Americans is all but lost. According to Mark Beach of north Tillamook County, a semi-retired history professor and lecturer, Indian nations tend to be classified according to each group's native language. In the case of the Tillamook Nation, which includes the Nehalem and Nestucca tribes, the primary language spoken was Salish. "The men spoke Salish," said Beach, "but the women tended to be bilingual or trilingual, because they were from somewhere else." Not only did Tillamook men tend to marry outside their tribe, said Beach, "there's clearly evidence of slave-raiding among all local tribes." 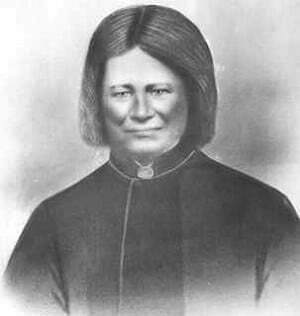 The Tillamooks, as with many Oregon tribes and white settlers as well, also spoke the Chinook jargon, a pidgin language used primarily for trading. Minnie Scovell, who died in 1972, was the last known speaker of the Tillamook language, according to her son, Joseph Scovell of Turner. Born in 1922, Scovell said he "can remember some words," but by and large can't speak his mother's native tongue. A law enacted in 1855 sent much of the Tillamook tribe to reservations, Scovell said, with some going to Grand Ronde and others to the Siletz reservation in Lincoln County. But some local Tillamook families chose to continue living alongside white settlers, including the Scovells. Growing up, Joseph Scovell was one of five brothers to attend public schools in Nehalem. There, he said, he saw himself as different from the others. His skin was darker; local residents knew that his parents were Indian. "In school, it was a bad thing if you weren't (considered) equal," Scovell recalls. Despite having been taught his tribal language during preschool, constant teasing in elementary school led Scovell to stop practicing his native language. Instead, he wanted to be like the other kids at school. Still, said Scovell, he does remember a time when it was "cool" to speak Tillamook. "After a while, the kids got tired of teasing us and they started calling the other kids names," he said. "So they would come to us and ask for Indian words to use for their name-calling. "We were fortifying them with foul names," Scovell laughed. Now a member of the Clatsop-Nehalem Confederated Tribes Council, Scovell said that after white settlers moved into the region, the young Native American students assimilated into white culture in the schools. They started speaking English; the older, Tillamook-speaking generation dying out. In hindsight, Scovell said, a school operated by the tribe likely would have been the only means of preserving the native language. A search of the Internet shows there are some of these schools in existence, but only a handful. Chemawa Indian School in Salem was the second such school organized in the U.S., opened in 1880. It exists as a high school today. But for the Tillamook tribe, there was no native school. What remains of the language is preserved in a "working dictionary," compiled by Laurence Thompson and M. Terry Thompson of the University of Hawaii. The Tillamook County Pioneer Museum has a copy of the dictionary, which Terry Thompson said is "not anywhere near publication as a dictionary and is not in a form to be shared at this date." The work-in-progress is 120 pages and contains approximately 2,500 Tillamook words. That language consists of 28 consonants, four vowels, three degrees of stress or emphasis, and six "intonational contours" (defined as the voice rising, falling, declining, dipping, raised or high falling). One of the language's oddities is that the same word is used for "but," "and" and "so." There are different words for the father of a male and the father of a female - but only one word for mother, one word for son and one word for daughter.  "The tide is coming in" - 'ts-ull-ULL-leel. Doug Deur, a research coordinator with the Pacific Northwest Cooperative Ecosystem Studies Unit at the University of Washington, is working to preserve less the stories than the tales of the Tillamooks and Nehalems. He is compiling a volume of local Indian tales based on the research and notes of May Edel, who spent a significant amount of time in 1930 studying the language and oral traditions of the Tillamooks and Nehalems. Edel, who at that time was earning her master's degree in anthropology from Columbia University (she earned her doctorate from Columbia in 1939), conducted fieldwork among the Tillamooks for her dissertation, "The Tillamook Language." Deur, a part-time Arch Cape resident, said Edel "charmed everyone" at so-called Squaw Town, an Indian settlement located between Garibaldi and Bay City. The Tillamook language officially died with Minnie Scovell in 1972, although scholars maintain it hadn't been used actively in communities since the late 1920s or early 1930s. But research by the Thompsons and others may yet help us gain a sense of what the Tillamook language was like.